You might remember that a year ago, at E3 2011, Ubisoft showed their unique game Killer Freaks From Outer Space. They showed the multiplayer where one player was playing the level and another one, holding the tablet controller, would spawn enemy freaks around the map. At this year's E3, the game had evolved in something completely new and, at least for me, unexpected : ZombiU! I got the chance to talk to one of the head developer and he shared some interesting info. Ubisoft wanted to use the new controller as much as possible and in focus groups, people had a hard time looking at both screens effectively because of the fast paced gameplay. They needed to slow the game down to give the players time to check both screens and understand what was happening. 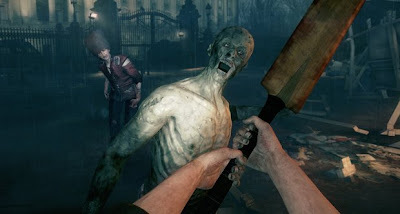 With slower enemies and fast action came the idea for zombies and the game became more of a survival horror. ZombiU is a step in the right direction for the survival horror genre that is leaning more toward action nowadays. In this game, you take it slow, you have to avoid being noisy and you need to conserve ammunition. I found myself shooting the zombies in the knees and then smashing there heads with my boot. The zombies will slash at you and eventually try to bite. Being true to the zombie genre, if you get bit, you die. The interesting part is what follows when you die. You'll come back as a new survivor of this apocalypse and go back to your mission. Once you get back to where you died, you'll come face to face with your old player now turned zombie and, by killing it, you'll be able to get back your stuff. The game plays well thanks to the WiiU tablet that is thoughtfully used. There's a map of your surrounding that you can quickly check by looking down and spot nearby zombies represented by red dots. Your inventory is always one touch away but beware, the game won't pause and you might get attacked. The tablet is also used to snipe with a crossbow and scan around you to find ammunition and items. You literally scan around you in real life, looking at your controller, no need to face the television for that. There's a small learning curve to get used to the two screens but once you get comfortable, it's great way to play and can also help to convey the sense of horror. The graphics were really good, the models interesting and the places we visited were well rendered. Everything was believable. Some people will be happy to know that the game is also pretty gory. You'll squash a lot of zombie heads and your weapons will become covered in blood pretty quickly if you kill those pesky undead when they're near. Sound effects were nice and worked at setting the mood and giving tension. The guy from Ubisoft made sure we had the headphones on when we played to catch every details, especially when we scanned a certain zombie that screamed in our ears to make us jump. It's a cheap scare tactic but it still made me smile. This is a game that I'm definitely interested to get at launch, the game as a lot of potential so every horror game fan should keep an eye on it. They confirmed me that it's supposed to be a launch title and that they are working close with Nintendo to deliver something great. I can't wait to be a survivor in this apocalypse and play with the tablet again. So far, this sounds like one of the best games from E3 2012. A survival game with precision and real consequences for death.